The foundations for excellent quality products where laid down from day one. 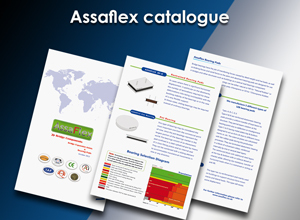 At AssaFlex we have an in-house laboratory, with staff testing every item manufactured. We have a rigid quality control system to ensure that our clients receive perfect products. Bearings are important elements of structures, such as bridges and viaducts, ensuring that they operate correctly. The durability of the structure depends on their quality, as they are in a constant state of use. Justify subsequently that it has been reached and checked. AssaFlex products are checked independently at certain intervals such as Esfahan’s Polytechnics or other reputable laboratories. Tests on samples taken in the factory in accordance with a prescribed test programme. CE marking will be then placed on the products. The last stage before leaving the factory is vacuum packed on palletized items.